Web application development services offered by SynapseIndia are incorporated with the best-looking design along with features of tools like CakePHP. The development services cover broad spectrum -- ranging from app integration and development to upgradation and maintenance. SynapseIndia has a team of seasoned web developers, designers, and industry experts. They have been in the business of web design and development a considerable span of time. The developers know how to leverage development technologies to create flawless web apps with innovative features. Besides, the web apps offer an engaging and dynamic user experience with an incredible user interface. Developers at SynapseIndia ensure that every web application is built with compelling graphics and cutting-edge functionalities. Additionally, all these are achieved while maintaining a defined budget. The developers use their talent, experience, and insight to successfully deliver unmatched web apps at an affordable price. 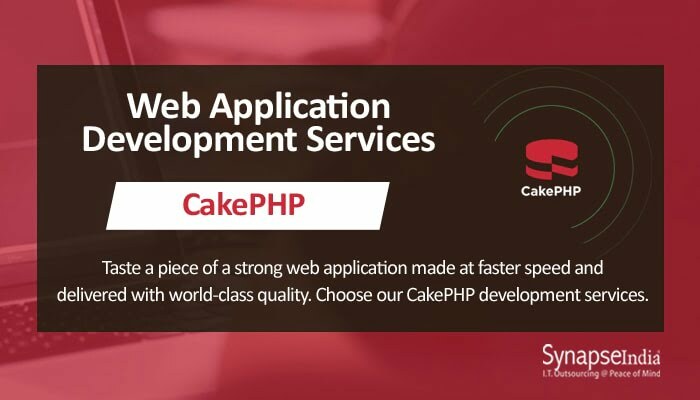 CakePHP is an open-source web development framework written on PHP. It follows a model view controller, or MVC, approach. The framework enables the developer to build web apps at higher speed. The framework is therefore suitable for delivering projects within a short turnaround time. Additionally, the use of the framework offers other advantages like built-in tools for input validation, and easy licensing for commercial applications.